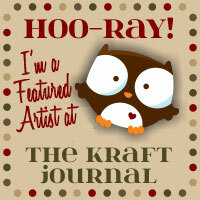 Each week we choose one project submitted to one of our challenges to feature on The Kraft Journal "Feature Me Friday" post sponsored by Kraft Outlet. This week we are showcasing this beautifully composed card created by Peggy of The Wired Angel blog. We were drawn to the crackling over the rooster image and the distressing that creates such a homey and vintage look to the project. To see all the details and learn more about our Featured Artist visit Peggy's blog. Thank you ladies! This is so nice of you and I appreciate it. I'll be back to play along again.